I don't have any need to explain in deep about the free blogging platform by Google that is Blogger. It's a freeware online utility for those who can't afford hosting and domain name. The only thing you needed to make your blog live is an active Gmail account, absolutely nothing else. A complete package of resources is provided free of cost by tech giant Google. Everything needed at initial available of blogging is embedded on this platform. As the blog you're running is on blogger platform so credits are mentioned in the footer. Scroll down to the bottom and there you will see "powered by Blogger" attribution. It comes by default in every template and represents blogger itself. If you're thinking to blog as a career in future then you must customize your blog. These default widgets look creepy to the visitors and you must remove them to make the readers feel good. Just follow the step by step guide to removing this widget. If you will try to remove this then you may notice that this widget is locked by default. Login into blogger dashboard with your account details. 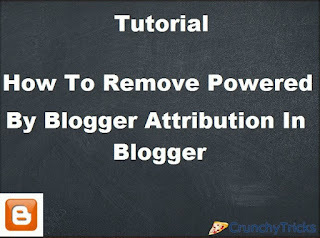 Select the blog from which you want to remove this attribute. Drop down Jump to widget and select Attribution1 from the list as shown below. Click anywhere on the screen and press Ctrl+F to open the search window. Now find the following code and replace true with false. Once all done simply save the template. After that move to Layout tab and at the end you can see attribution gadget. Simply click on edit button. In the popup window click remove and that's it. Go to the template and click on edit HTML button. Click anywhere on the screen and press ctrl+F to open blogger's search box. Copy and paste the following code just above red color code. That was all. Drop your doubts and query below.